Brandon Hayes the owner and founder of Valor Janitorial attended the Violand Business Planning Retreat in Tempe, Arizona November 11th and 12th to gain new industry insight and new advanced business skills. The creation of a newly detailed business plan will allow Brandon to align company business goals with customer satisfaction. Also the Violand team of advisors gave expert advice on a number of topics including operations, human resources and measuring business objectives. 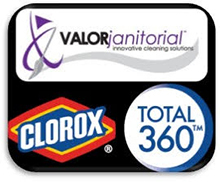 One-on-one training with an expert Violand advisor also gave the Valor Janitorial company owner new skills and confidence for fulfilling customer needs and achieving customer satisfaction and customer retention. Brandon is also committed to coaching all Valor employees on how Valor will succeed through customer satisfaction. Brandon was very grateful for having been able to attend the business planning event in Tempe and is always working to gain new skills and methods for improving Valor and improving customer satisfaction for Valor's customers.